On June 23, I took a day for myself and left the three boys to their own devices. Of course that meant major sketchy time! I wandered around Mykonos’s maze of streets, fully hoping to get lost, but I already know it too well. I sketched a typical Mykonos street, having walked away a couple of blocks from the tourist shops to where locals live. In spite of the picturesque scenes everywhere here, and my option paralysis as to what to sketch, a lot of scenes I found were not doable because there was either no shady spot or the wind blew so strong that it was impossible to hold a sketchbook open, never mind a single piece of watercolour paper. But I walked away from the water and found a wind-free, shady ledge with a good view. The painting took me about an hour or maybe 90 minutes. I lost track of time. I tried to just paint shapes instead of lines, I left out a lot of details, and I used somewhat random colours in a few areas, but the main composition is what I saw. 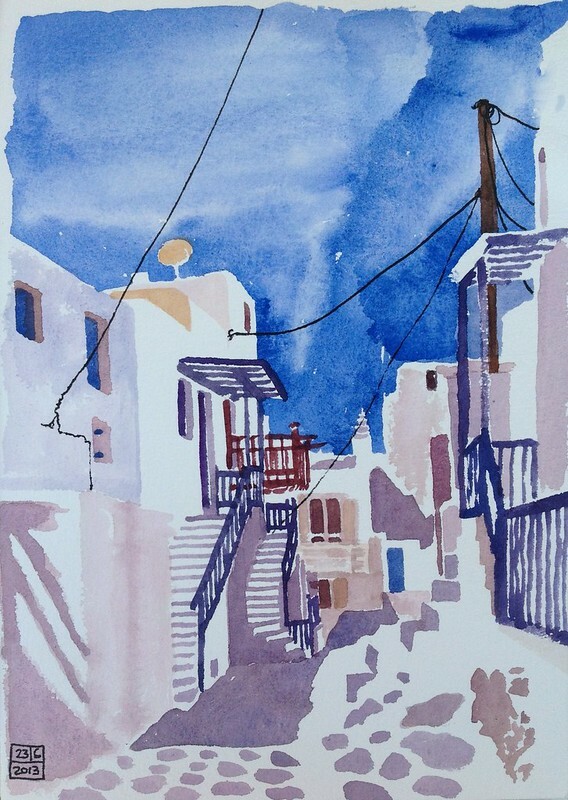 I had just finished painting and was wiping out my brush and watercolour kit, when a plate of grilled meats, bread and mustard was handed to me by a friendly 60-something Greek man. “Here, you must be hungry,” he said and I realized I was. I gratefully accepted, and he said “come have a beer with us too” and pointed up the street where I’d noticed a man grilling on the street. So of course I did. This is how I met Kostas, a Greek hotelier, his Rumanian wife Marianna, her 18-year old son Marius and her brothers George and forgot-his-name. It was George’s birthday so naturally I also had to have birthday cake with them. Then they showed me their hotel, Lefteris Hotel, which has the most gorgeous view over Mykonos and faraway islands from their rooftop terrace, and we talked about Greece and Colorado and Whistler and Chicago, where Kostas had lived for 20 years. He turned out to be a big ski fan, he had met Toni Sailer (a famous Austrian skier) and Billy the Kid (American skier), who had stayed at his hotel. George asked me how to get into Canada with his construction skills, and I gave him my business card and invited everyone, but especially the teenager Marius, to visit us. We don’t have kids, but we are in the habit of hosting older teenagers at our place for months, to enrich their lives, to give them and their parents a break from each other, and also to infuse our lives with some young-people-energy. They tend to be at their most mature with us precisely because we are not their parents. Then we happily give them back and enjoy our freedom. Anyway, this is what can happen when you sit on the street and sketch. Do it! Mykonos is full of scenery and the high contrast between the deep blue sky, the strong shadows and the white washed walls lends itself well to black and white photography. Being a visual person, I am walking around in a bit of a sensory overload daze. And of course I am taking a couple of photos.